Why should I grow with a Hydroponic Weed System? This is the result of an experiment done by General Hydroponics. 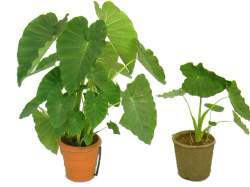 Both of these plants are the same age and were taken from the same nursery stock. One was grown hydroponically and one was grown in dirt. Can you tell which is which? 300% more nutrients than soil grown produce. We are already seeing a push for more earth friendly farming practices, higher yield gardening and self sufficiency. Possibly in the future each family will, by necessity, have to grow at least a portion of their own food. Hydroponics fits into the scheme of these things because of its high yield/low space nature. A 10'x10' hydroponic greenhouse can easily provide a family of 4 all of it's produce - year around.